During this unit we are going to look at the area where most poker players make their biggest mistakes, actions before the flop. The decisions we take before the flop are very important, and without good decision making here, you could find yourself in all sorts of trouble after the flop. We will spend some time looking at Starting Hand requirements and some fundamental poker concepts such as Table Position. This Unit will form the backbone to your strategy, so read it carefully and practice practice practice! 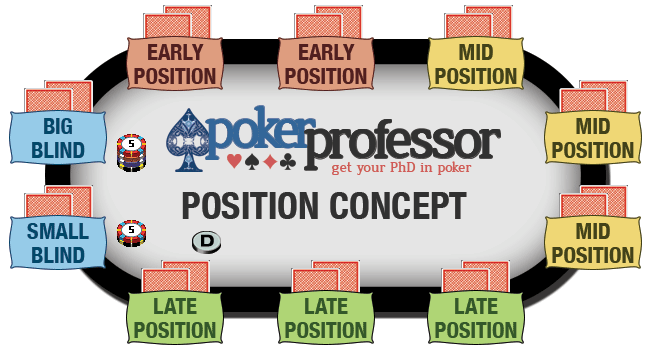 The first concept that we are going to show you is the Poker Position Concept. This is one of the most fundamental concepts of Poker, and it’s very important that you understand this before you move on. Position refers to where you are seated on the table in relation to the dealer button. Play always goes clockwise so the position you are in determines what order players act in, which has a big effect on the decisions we make. We split the table into 4 positions, Early Position, Mid Position, Late Position and the Blinds. Blinds – The players who put in the small and big blind, these are the two players to the left of the dealer button. Although these players act last before the flop (due to the forced blind bets) they are first to act for the rest of the rounds, so these are considered Early Position. Early Position – The 2 seats to the left of the Blinds, these are the first people to act after the cards have been dealt. Before it is your turn to act, you see what everybody else has done first, this means you have more information in order to make your decision. Opponents tend to play more cautiously when there are still players left to act after them, this presents a number of bluffing opportunities where you can win a pot uncontested just because you are in the best position and can take advantage of opponents’ weakness and cautiousness they have shown. Playing “in position”(late position) allows us to control the hand, we have more control over the size of the pot and can keep it small if we wish, or get more money into the pot in the right situations ensuring we get good value on our strong hands. The later we act the less people there are to act after us, so therefore less chance that a person still to act after us is holding a big hand. You have a marginal hand 3 3 and are in late position, you may be considering playing, but if a player in Early Position raises, then you will more than likely fold your hand, because a player has shown strength already and we are holding a quite marginal hand. Compare this to holding the same hand in Early position, you have now got to make the decision on whether to play or not before you see other peoples actions, which could lead to you putting chips in to play the hand and a player in later position raising and forcing you to fold your hand. Can you see the difference – in both situations you have folded your hand, but when in late position you have done so without committing any chips into the pot, whereas in Early position it has cost you to fold your hand. It is for the reason outlined above that we prefer to play in late position. We will play a wider range of starting hands from late position than we would from middle and early positions. You will see from the starting hands that you learn in a later lesson that we play a lot more Starting hands from a late position, and only play the strongest hands from early position.